The small crossover has supplanted sedans as the new family car. 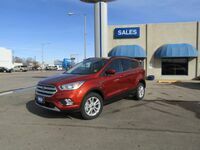 The 2018 Ford Escape in Ogallala NE is one of the leading models in the small crossover segment. Car shoppers considering the 2018 Escape will have multiple engine options and trim levels to choose from. 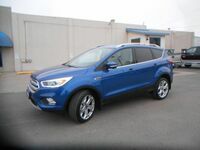 The latest version of the Escape offers a variety of impressive features and technology systems. Three engine options will be offered on the 2018 Ford Escape. Standard equipment will include a 2.5-liter four-cylinder engine rated at 168 horsepower and 170 pound-feet of torque. The second engine offered on the Escape is a 1.5-liter EcoBoost four-cylinder rated at 179 horsepower and 177 pound-feet of torque. The final engine offered is a 2.0-liter EcoBoost four-cylinder engine producing 245 horsepower and 275 pound-feet of torque. Both front-wheel and all-wheel drive systems are offered on the 2018 Escape. Comfort and Technology Features:Bluetooth and USB connectivity, dual-zone automatic climate control, keyless entry keypad, heated seats, Apple CarPlay and Android Auto, SYNC 3 touchscreen infotainment system, LED daytime running lights, WiFi, leather-wrapped steering wheel, Sony audio system, HD radio, keyless entry and ignition. Safety and Driver Assistance Features:Rearview camera, MyKey parental controls, front and rear parking sensors, blind-spot monitoring and rear cross-traffic alert, lane departure warning and intervention, forward collision warning with automatic emergency braking, adaptive cruise control. When properly equipped, the 2018 Ford Escape is able to tow up to 3,500 pounds with the 2.0-liter EcoBoost four-cylinder engine. With the rear seats folded down, the Escape offers 68 cubic feet of storage space.